Tried this at a food festival last year and loved it. usually £1.98 a bottle now it works out at £1.25 a bottle. Not sold every where like other brands and not in all tesco's either, so I was happy to see this on the shelves. Not sure where the cold is coming from here as no-one has commented yet. Don’t vote cold because you don’t like ginger beer, vote cold because you’ve seen it cheaper elsewhere and then be kind enough to tell us where to buy it cheaper. Hot from me. Not sure where the cold is coming from here as no-one has commented yet. … Not sure where the cold is coming from here as no-one has commented yet. Don’t vote cold because you don’t like ginger beer, vote cold because you’ve seen it cheaper elsewhere and then be kind enough to tell us where to buy it cheaper. Hot from me. Thanks. 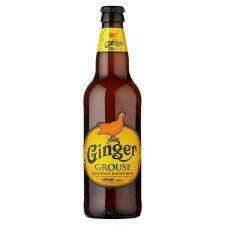 I never liked ginger beer before but this one was really nice, plus it is the cheapest i've seen it yet. Trying for the first time now, very nice over ice.